In describing The Conjuring the most obvious touchstone is 1979's The Amityville Horror, and with good reason. Just like that film about the alleged demonic possession of a house, The Conjuring is based on a similar case investigated by the same paranormal experts that first scrutinized the Amityville house, Ed and Lorraine Warren. Ed (Patrick Wilson) is a no-nonsense kind of guy whose refusal to allow himself and his wife to be labeled as any kind of ghost-hunters belies the fact that he is the only person outside of the Catholic Church that the Vatican allows to conduct an exorcism. And Lorraine's prim and proper fastidiousness disguises her preternatural ability to communicate with forces outside of our normal ken. A lot of attention is paid by the filmmakers to setting up the Warrens as a bright light of decency which cuts through the fog of dread that always seems close to enveloping them. Lorraine's continual confrontations with evil take a physical toll on her, and Ed's desire to protect her underscores that it is their powerful bond which endows them with the vigor necessary to ward off the evils they encounter. In contrast, Carolyn and Roger Perron (Lili Taylor and Ron Livingston) are the struggling parents of five girls, just moved into a dilapidated home in order to make ends meet on dad's earnings as a truck driver. The family is holding together, but there are fissures to be exploited. The Perrons become the object of the evil campaign because, it's implied, their union is weaker than that of the Warrens. A key element in another horror film, 1980's The Shining, is the way that movie's caretaker is overcome by a haunted hotel by way of the psychic cracks created by his alcoholism. 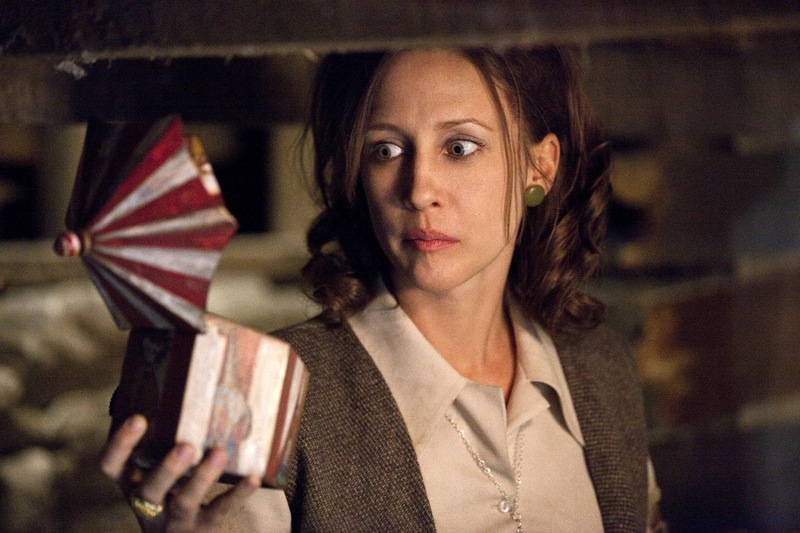 In The Conjuring, it is Carolyn—stressed by raising five daughters alone for extended periods of time and on a meager budget—who is starting to show signs of fractures through which demons may seep in. It's basically predestined that Carolyn will be targeted by the demon haunting their house after we learn the malignant spirit is a witch whose present existence in a ghostly purgatory is tied to an unspeakable act she committed as a twisted mother. But as the spirit gains strength, and the Warrens start showing subtle signs of discord themselves, her attention turns to them. Director James Wan forgoes the repulsive gore and graphic torture he utilized to scare us in his debut film, Saw, relying instead on nuanced performances by a solid cast to manipulate our emotions. To his credit, he employs camera techniques more often associated with The Conjuring's 1970s period setting than today—zooms, montages, extended takes with a steadicam—tapping into a sort of collective sense memory for those old enough to have seen genre fare firsthand at the time. In allowing nearly half the film to unspool before stepping up the frequency and level of frightening incidents, Wan shows a patience that has been sorely missed in many of today's movies which often seek to pile on setpieces and amplify their thrills in a manner which ends up feeling programmed and numbing. Instead Wan teases us, most prominently with a game the Perrons like to play in their spooky new house called "Hide-n-Clap." Even the most naïve of us should be aware that such a game in this kind of house cannot end in any other way but with either a character or the film's audience screaming. But Wan enlists us by delaying the physical gratification we expect until the tension has been drawn out almost beyond its usual breaking point. The visual punchline to this child's game is both expected and mundane, but it is the very banality of it which makes it frightening. Wan's refusal to shape the movie using any measure of pretension ultimately lends The Conjuring authenticity. 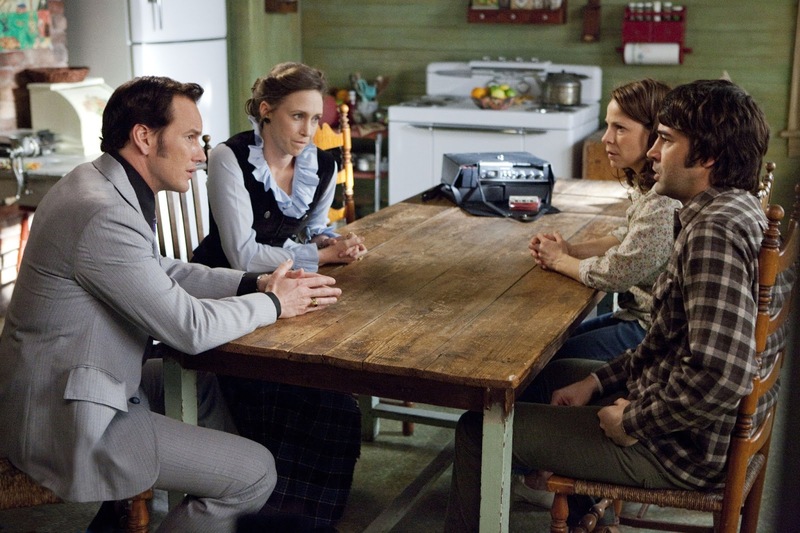 From Ed's regular-joe-nor'easter accent to the film's sincere celebration of family and spiritual values, there is a strong foundation of truth on which The Conjuring is constructed that makes it feel more terrifying, not less so. That the central taboo fueling this particular haunting is something as commonplace yet unnatural as filicide only makes the story even more mournfully prosaic in the best way. 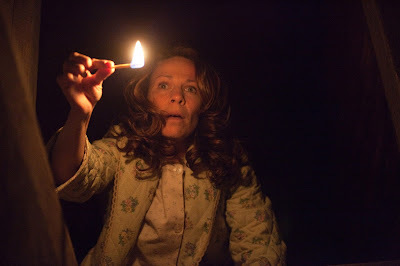 In going back to the familiar, The Conjuring forges a new direction for future horror films to hopefully go forth. Hopefully, it will inspire today's filmmakers to do more than pay lip-service to the pictures that preceded theirs. I must check this out, Tony. Thanks for the review and heads up. Great review, and I agree with you on all the observations you made. This year so far has been full of more anthology and found footage horror ('The ABCs of Death' and 'V/H/S 2') and excessive gore horror (the 'Evil Dead' remake, which I recall you reviewing), and Wan's old-fashioned, even uplifting brand of horror is all the more impressive by not following current trends.